It's been a while since I've used the ice cream maker. When I received a bottle of Azeite Esplendido olive oil in the mail from Seattle's own Esplendido Douro, I knew I had to make ice cream. I've never made or even had olive oil ice cream before but is something I've always wanted to try. Ice cream is typically loaded with sugar but I wanted to try making one with honey instead. Raw honey contains a lot of beneficial nutrients but many of those nutrients can be damaged or lost if the honey exceeds 100 degrees. I wanted this ice cream as nutritious as possible so I added the honey only after the ice cream was cooled down to around 96 degrees. Olive oil also has many health benefits. It's said to reduce inflammation and reduce the risk of all kinds of diseases. You can read more about the health benefits here. Esplendido's olive oil is cold-processed to retain nutrients and made from pesticide free olives grown in the hills of Portugal, overlooking Douro Valley. In their first year of business they won a gold award from the New York International Olive Oil Competition. I'm not an olive oil expert but I have done an olive tasting before and can taste the difference between a good and bad olive oil. This olive oil is better than your average olive oil. It's very fruity and I was pleasantly surprised by the peppery finish. 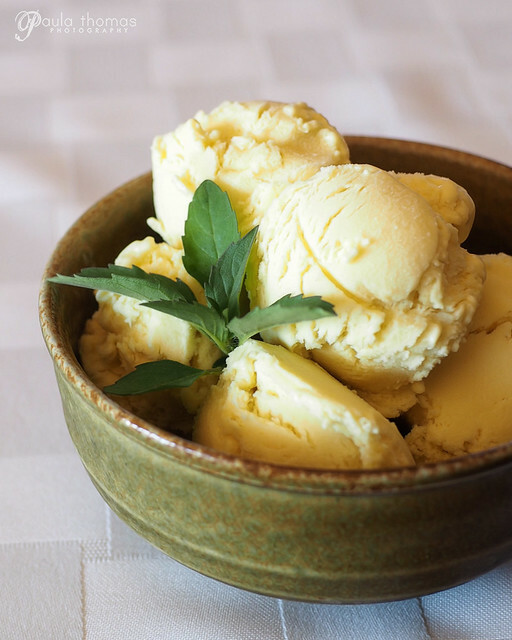 It worked great in this ice cream recipe and would be a good olive oil to use for salads, dips, bread dipping or to finish off any meal. 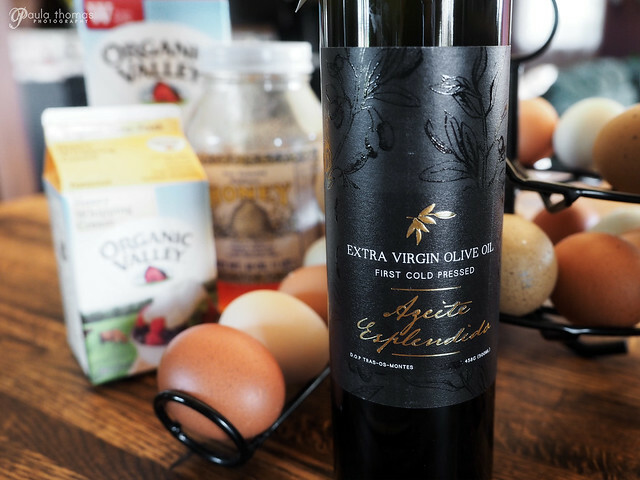 You can find their olive oil around the Pacific Northwest but are planning to expand to other locations in the near future. You can also order through their website if you can't find it locally. If you've never made ice cream before, it's really really important you don't overcook it, no really. I knew this. Yet, in my attempt to get a good photo of the temperature reading while it was cooking, I let the first batch cook a little too long and the result was a chunky, nasty mess. The first batch, it ended up going into the trash. The mixture went from perfect to chunky so fast. Luckily, I hadn't added the honey and olive oil yet so I was just out a couple of cups of milk, some cream and egg yolks. The second batch turned out perfectly. 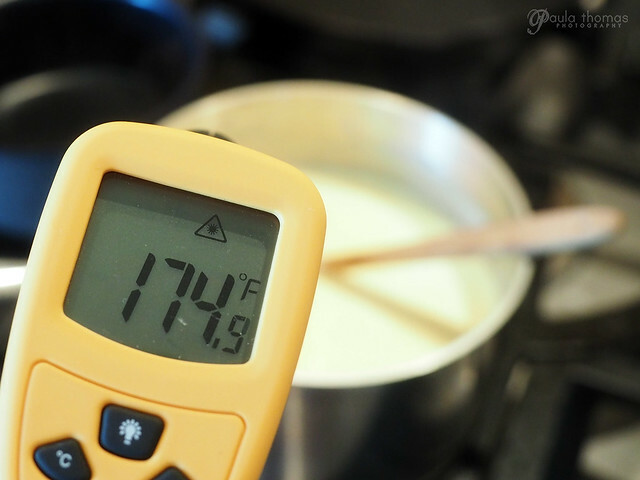 Heat milk, cream and pinch of salt in a medium sized saucepan over low to medium heat until 190 degrees (just before boiling point), stirring frequently. 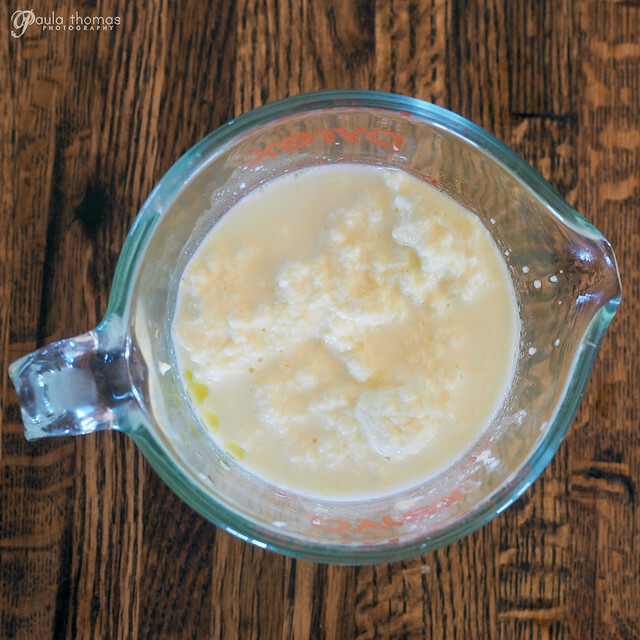 Add yolks to a small bowl and whisk eggs while adding a ladleful (about 1/2 cup) of the hot milk to temper the eggs. Whisk the tempered eggs into the pan of milk and return to heat, stirring constantly (do not leave unattended). Heat for a few minutes until temperature reaches about 175 degrees. Mixture should thicken slightly. Do not keep at or over 175 degrees for too long or you will end up with a chunky mess as pictured above. If you start noticing it get the slightest bit chunky, remove from heat as soon as possible. Strain the mixture through a fine metal strainer to remove any chunky bits. If it gets too chunky, no amount of straining will fix it. Cool the mixture to 95-97 degrees. Stir in the olive oil and honey and chill 4-6 hours in the refrigerator. 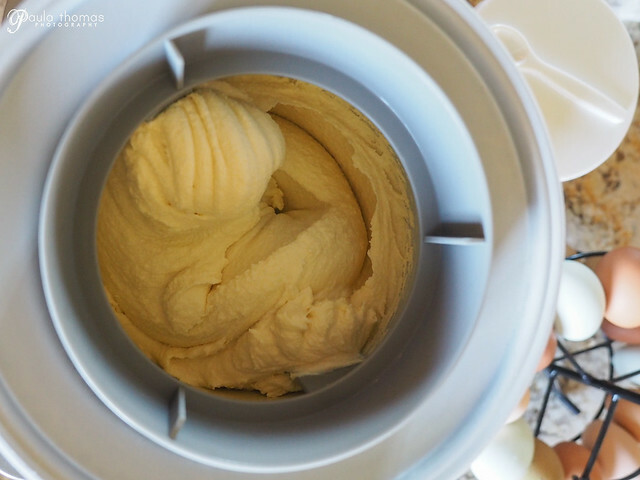 Add mixture to an ice cream maker and run until ready, usually 20-25 minutes. Serve plain or with your choice of toppings. Disclaimer: I was provided with a free bottle of olive oil from Esplendido Douro in exchange for a blog post. All thoughts and opinions expressed are my own and not influenced in any way.